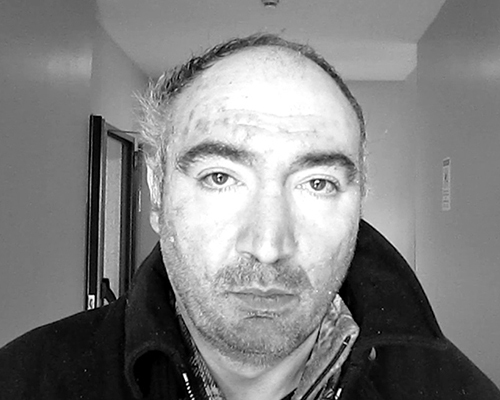 Rodolfo Spagone, the main character homeless of "AL DI QUA", has died on Wednesday November 23rd, 2017, due to health reasons related to his homeless life. 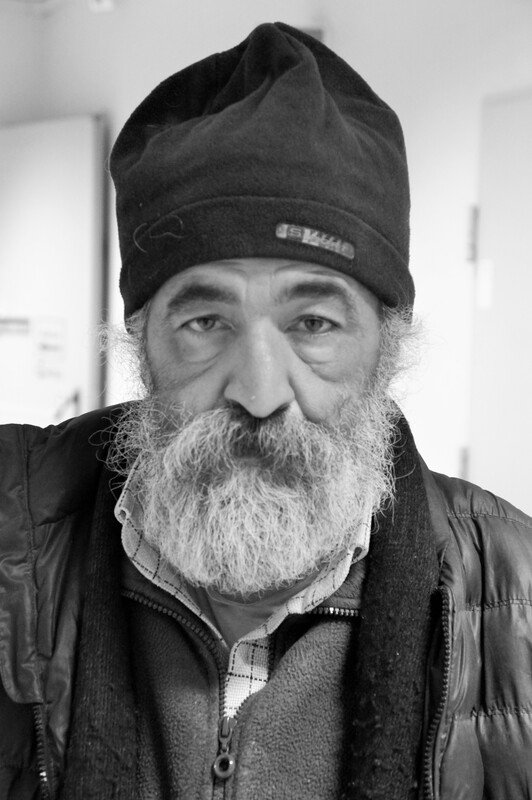 Rodolfo Spagone, the main character homeless of my documentary film "AL DI QUA", has died on Wednesday November 23, 2017. I am very sad and very shaken. I cared for Rodolfo very much and I'm sure he loved me too. He was a very sweet and dear person. Unfortunately, what is happening in the movie is what unfortunately is happening in reality, and this reality happens more and more often. This time, though, Rodolfo really went to Heaven. There is a way to remember him. That the authorities, the politicians finally deal with the poverty problems of the homeless, abandoned to themselves. 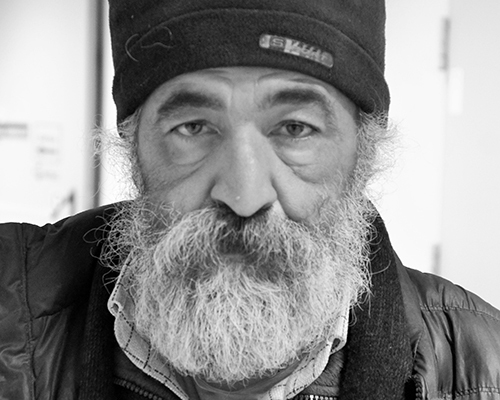 Rodolfo was a homeless, he did not have a home, he did not have a job. His life was a constant struggle, sleeping on the street. He died of pneumonia. 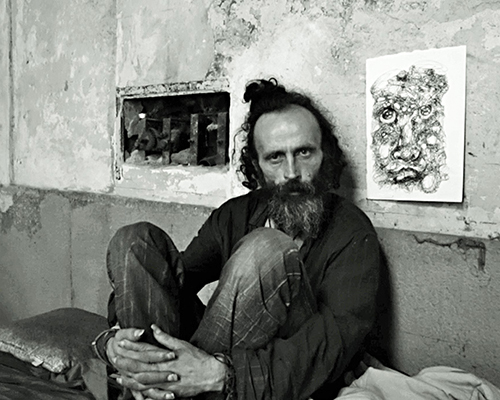 He was one of the 4.8 million people living and dying in absolute poverty in Italy. In the United States there are 40 million people in the same situation. Rodolfo died at age 60. Rodolfo says in the movie: "Dreams? Having a home, a job, being set." When Rodolfo saw "AL DI QUA’" he cried for the first time, during the length of the entire movie. 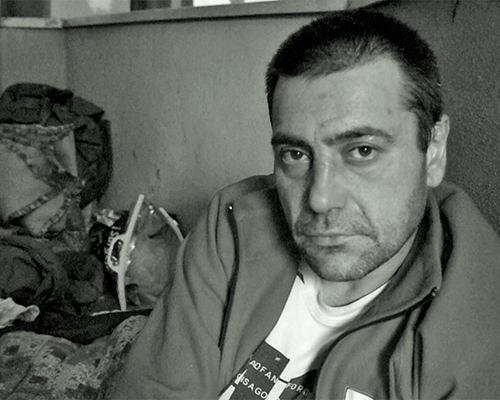 Antonino, another star in the film, says: "I wanted to express a wish for all of us who are living on the street, and I am still in it, and I wish for all of us to have a home, because we deserve it. A home for everybody ". At the moment I'm in Los Angeles for the Oscar campaign of my docu-film "AL DI QUA”. I visited the Skid Row, the in the whole neighborhood there where thousands of homeless people, abandoned to themselves, in their tents. It's a terrible Dante’s infernal ring. This must end, in the US as well as in Italy and the rest of the world. They are all our brothers. We should all be brothers. An income, a home, and a job for everyone. And fewer differences." "AL DI QUA" (Life/Here) is a poetic social protest docu-film, shot in a visionary and rigorous style, on the humanitarian tragedy of universal poverty and homelessness. 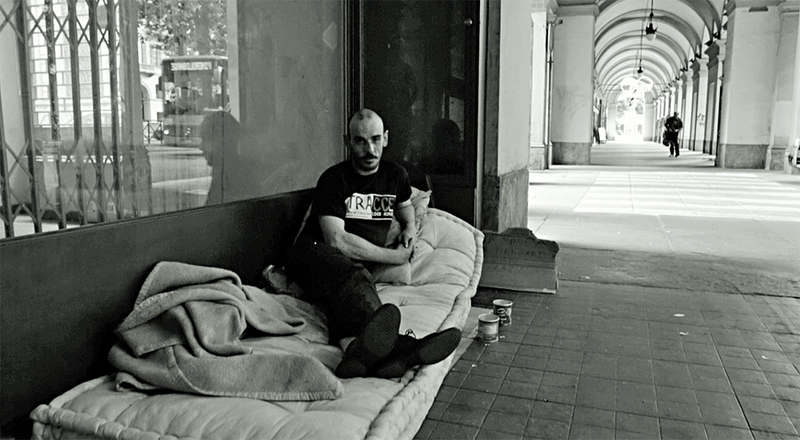 The Pasolinian film shows the homeless of Turin, but could be set in Los Angeles or London or Paris. 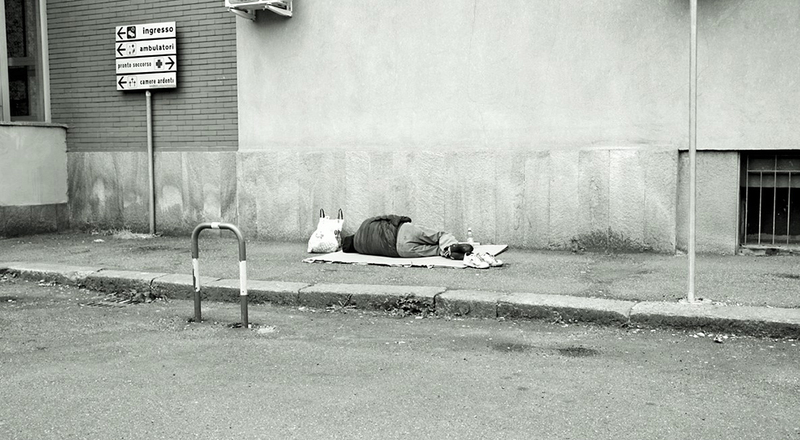 In Italy, approximately 5 million people live in total poverty. In Europe, approximately 122 million people are on the poverty line and risk social exclusion. Approximately 800 million people in the world suffer hunger. In the United States there are 550,000 homeless people, according to U.S. Dept. of Housing and Urban Development estimates for 2016, and more than 40 million people live in poverty, according to U.S. Census data. 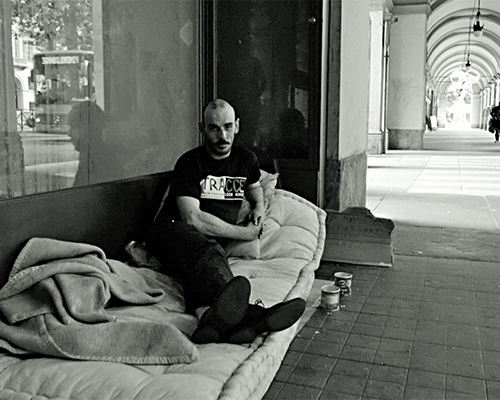 In New York there are more than 60,000 homeless people and in Los Angeles nearly 58,000. Included in the film are verses from 'The Book of Hours' - 'The Book of poverty and death' by Rainer Maria Rilke. Music is from 'Passion According to St. Matthew' ('Matthäus-Passion BWV 244') and 'Passion according to John (' Johannes-Passion BWV 245 ') by Johann Sebastian Bach. "AL DI QUA" in Italy has obtained nothing but enthusiastic reviews, it has been hailed as a masterpiece, and won very prestigious awards (see below). 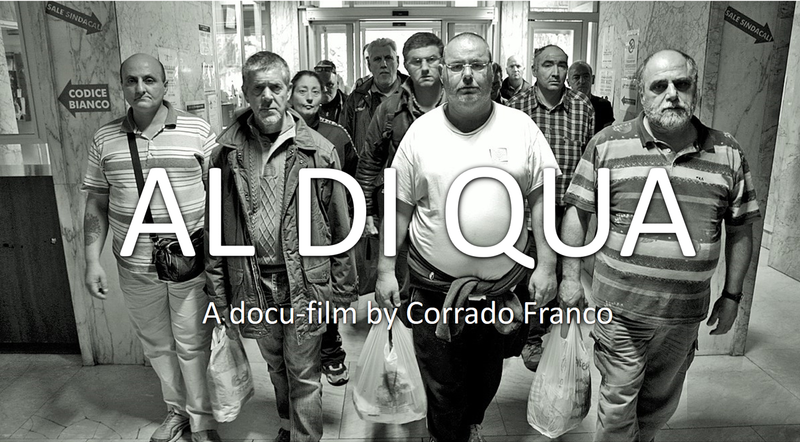 "AL DI QUA” has been submitted to participate in the 2018 Academy Awards - Best Feature Documentary. "AL DI QUA" will be screened at Laemmle's Music Hall Theatre, Beverly Hills, Los Angeles, from October 27, ending on November 2, 2017, showing: 1:00PM, 3:10PM, 5:20PM, 7:40PM, 9:55PM and at Cinema Village, New York, from November 24 to November 30, 2017. The "AL DI QUA" Oscar® campaign is largely funded by Guido Giubergia from Ersel, and, to a minority extent, by the Film Commission Torino Piemonte and Andrea Kerkoc's Avocado Pictures Productions. A homeless man is found dead in his makeshift bed on the streets, adjacent to a hospital where he often stopped. 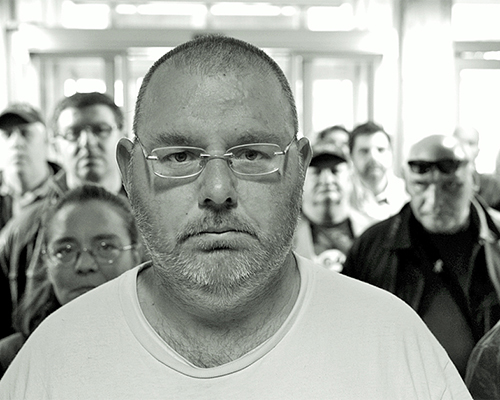 Forty of his homeless friends enter, as a united front, into the hospital to pay him their final respects. After a visionary funeral march down the hospital corridors, the forty homeless people denounce that they have no longer been working for many years and are sleeping on the streets. The finale is miraculous, in style of Vittorio De Sica, made with special visual effects. 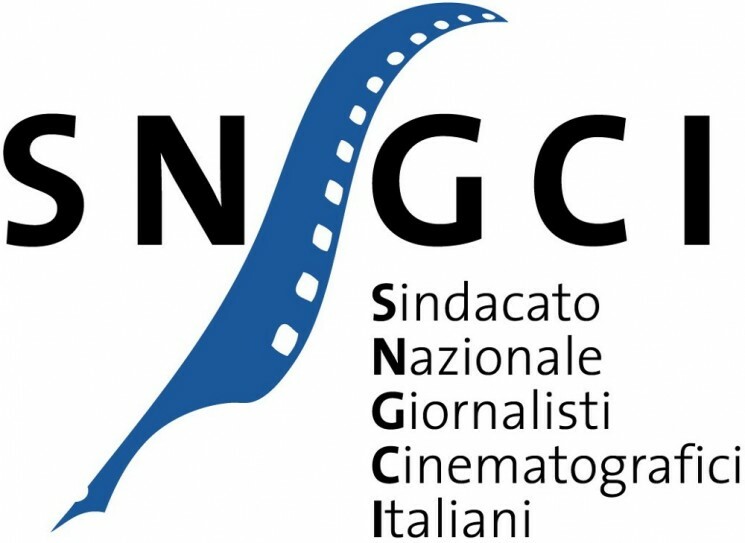 "AL DI QUA" achieved the "nomination" for the NASTRO D’ARGENTO (silver ribbon) in 2017 as BEST ITALIAN DOCUFILM, which was awarded by the SNGCI, the Italian Film Journalists Union. 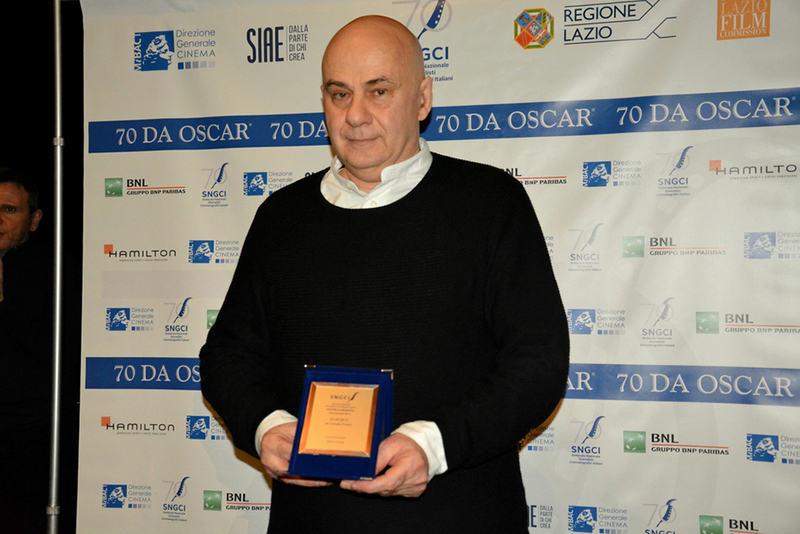 "AL DI QUA" achieved the "nomination" to the CIAK D’ORO (golden ciak) 2017. CIAK is the most important film magazine in Italy. 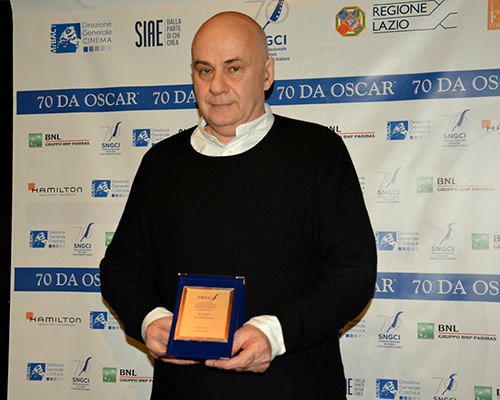 "AL DI QUA" was also submitted to the DAVID OF DONATELLO 2016 Film Award (the Italian Oscar) and ranked 8th out of the 127 Italian documentaries in the competition. It missed the target of the 5 main nominees by only 7 votes out of a total of 1039 voters. THE HOLLYWOOD REPORTER, Robert Abele, 11.24.2017: "A solemn reminder of the humanity of those society chooses not to see. 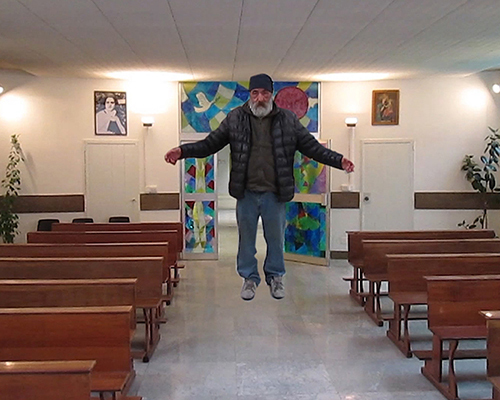 Corrado Franco's artful doc lets the homeless men of Turin tell their own stories. 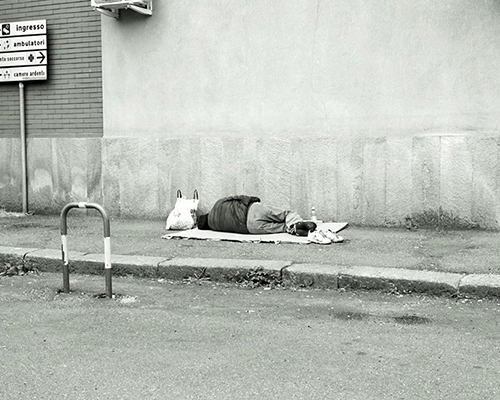 A self-consciously solemn meditation on homelessness in Turin, Italy, Corrado Franco's Al Di Qua lets that city's poor speak for themselves even as it coyly acknowledges the way Franco frames their experience. Attention-grabbing for its artifice but most affecting when it is unadorned, the film will find many admirers as it makes an Oscar-qualifying run in NY/LA. Getting that nod may be a long shot (according to THR's Scott Feinberg), but the distinctive film will put Franco on the "to watch" list of some observers in the doc arena. 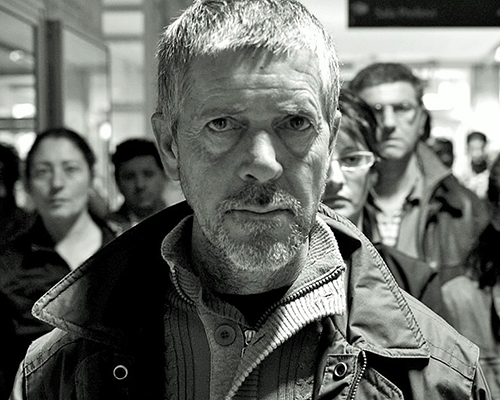 Filmed in black-and-white, the picture spends much of its time in and around an unidentified hospital where Turin's homeless population seeks aid. It begins with an arresting eight-minute monologue in which a man named Emanuel speaks directly to the camera, acknowledging that "my life up to now has been going ... I can say, very badly." Emanuel recounts the many jobs he has held and his Army stint in Bosnia before getting more philosophical, describing his positions on alcohol (make sure you're drinking it, not letting it drink you) and God ("I believe only in myself," he says). 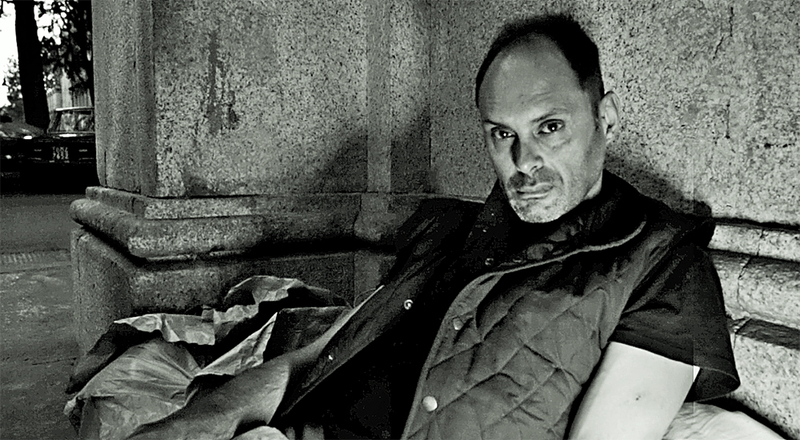 After this extended speech, Franco offers wordless street scenes, playing mournful Bach choral works as he slowly pushes in on men occupying mattresses and blankets on the city's sidewalks. Though these men don't get to speak to us, Franco ensures that each holds the camera's gaze and each is introduced by name. Fifteen minutes or so in, the film observes as an EMT discovers the dead body of a man called Rodolfo. 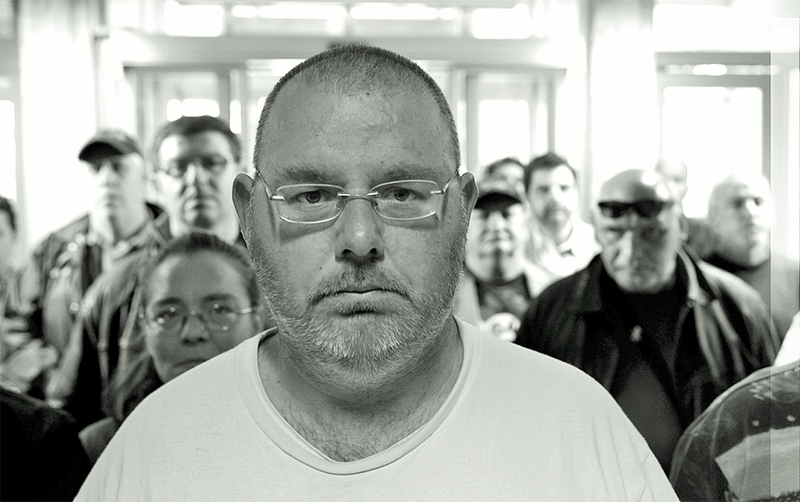 Some viewers will suspect that this is a staged scene, and they'll later be proven right — the conceit of the rest of the film is that other homeless men and women have gathered at the hospital to pay their respects to Rodolfo, taking the occasion to speak to the camera and us. Franco translates his title as "life here," and in the ensuing interviews, subjects have clearly been prompted to sum up what life is currently like for them. Some enjoyed a measure of domestic comfort until recently, and many were brought low by the loss of parents: One man, an only child, reports that after both his mother and father died, "my so-called light went out" and he suffered both depression and panic attacks. But mental health and substance abuse are sidelined here. Franco showcases interviewees who can speak cogently, and views them as victims of society. Pairing its Bach with long voice-over quotations from Rilke, the film recalls Wings of Desire, another monochrome attempt to look within the souls of humans who go lonely in the midst of crowds. Franco digitally slows down his speakers' voices, just enough to drain away any conviviality they might offer; this and other technical choices will seem manipulative to some, but it's almost certain that, had he wanted to wallow in misery, Franco could have chosen interview clips that were more bleak than these. 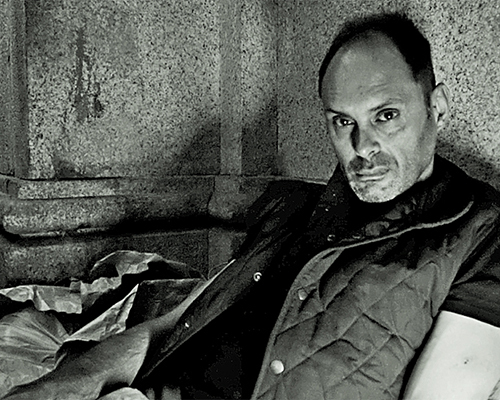 Midway through, the film offers an enigmatic scene in which a man rooting through a dumpster gets some instruction from an offscreen director. "Cinema is cinema," admits a title card. But it isn't until a closing sequence in the hospital's chapel that the filmmaker's manipulations threaten to upstage his message. LOS ANGELES TIMES, Robert, Abele, 27.10. 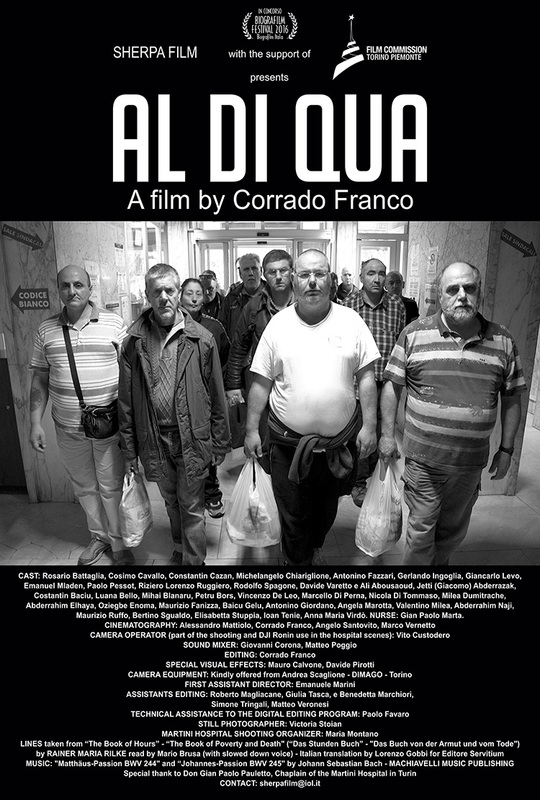 2017: "Italian filmmaker Corrado Franco’s “Al Di Qua,” filmed among Turin’s homeless population, is not your typical social issue movie. Few would have the notion to give one of his subjects, a bearded street fellow named Rodolfo, an on-screen funeral in which dozens of his fellow itinerants form a procession to enter a hospital chapel for a testimonial-laced service complete with ghostly special effects and levitation. 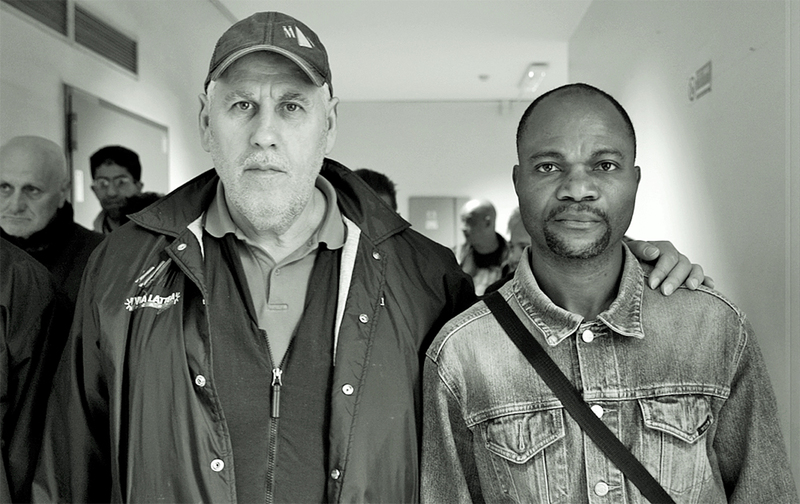 Franco’s combination documentary and art film features real sufferers of poverty and destitution telling heartbreaking tales of woe. There’s even a pattern to many of the stories: unexpected financial hardship and emotionally devastating detours into depression or grief suddenly render hard-working men and women invisible to society at the point of their direst need. Says one, “My so-called light went out.” Another, referring to his altered vision of the world, seeing materialism in humans now, not love. 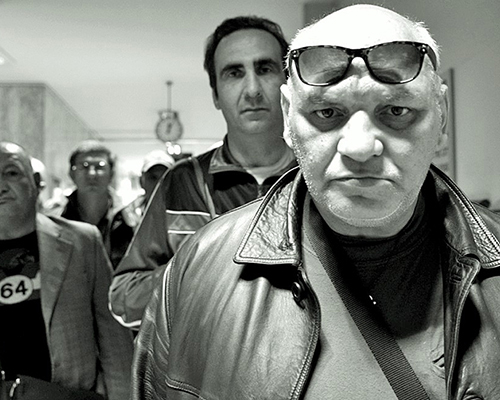 Filmed in black and white, with subjects speaking directly to the camera — their faces older than their years, and their voices decelerated on the soundtrack so that they all sound collectively slowed by life — “Al Di Qua” is both necessary and, in Franco’s more flamboyant touches, perhaps a bit thickly applied. But even as recitations from Rainer Maria Rilke’s prayerful “The Book of Hours” (also reduced in speed) and the swelling sounds of Bach’s “Passions” overwhelm the proceedings, it serves a crucial point that these are truly God’s forgotten creatures." The Hollywood Reporter, 11.01.2017, Scott Feinberg, "Feinberg Forecast: Updated Oscar Standings. The listings below reflect how The Hollywood Reporter's awards columnist Scott Feinberg believes the Oscar nominations would look if the race ended today." "AL DI QUA" is in the 50 Favorite Documentary Feature listing for the Oscar! 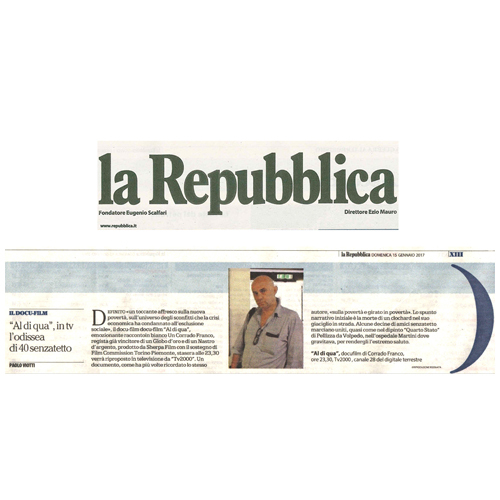 LA REPUBBLICA, the most important Italian newspaper, Mario Serenellini: "Masterpiece", "A great example of cinema", "AL DI QUA shines in its Franciscan simplicity", "Its technical subtlety aspires to Pasolini’s sublime". 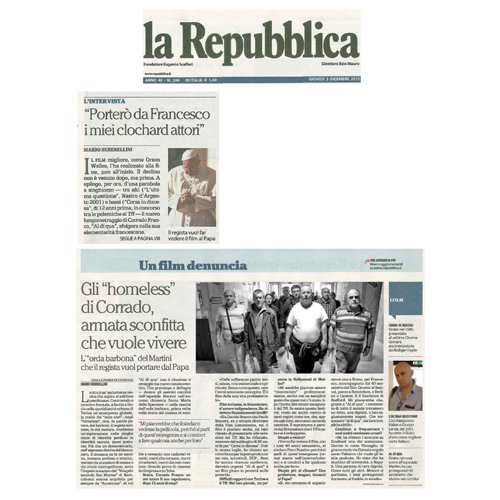 LA REPUBBLICA.IT, 10.03.2017, Federica Polidoro: "Corrado Franco's docufilm, inspired by the death of a homeless man, was one of fifty films that made it as a finalist for the Nastro d’Argento Award and will also be screened in New York. 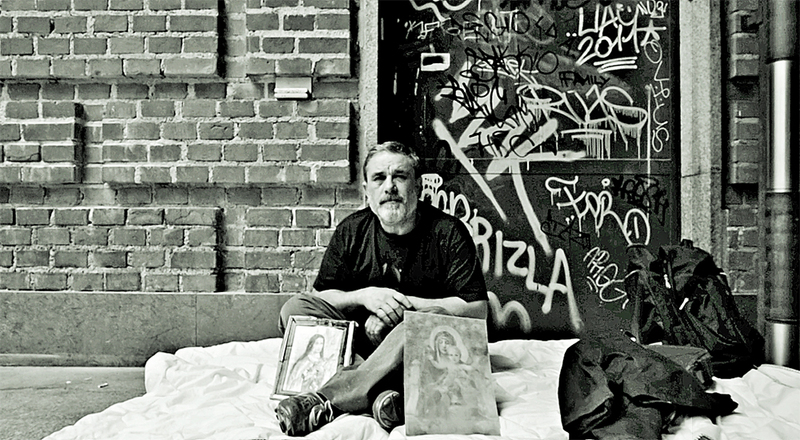 ‘Al di qua’ by Corrado Franco denounces poverty, indigence, social discomfort and the existential situation in which homeless people are found in the world, rising with the global crisis. ", "It will then be screened in the United States in New York and Los Angeles, cities where homeless emergency is endemic, so that it can enter the Oscars as Best Documentary 2018." 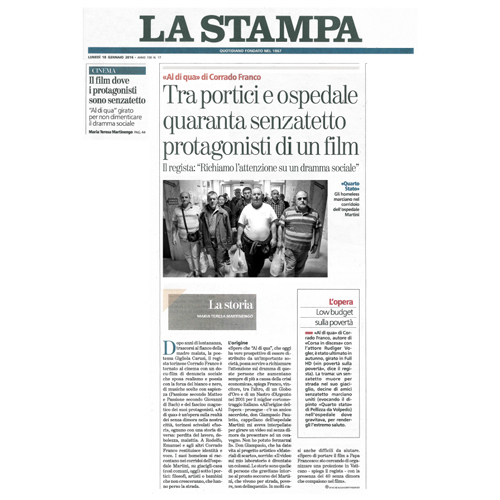 LA STAMPA, one of the major Italian newspapers, Maria Teresa Martinengo: "A docu film about social justice that marries realism and poetry with the dramatic strength of black and white film, the carefully selected music with the mesmerising stories of its protagonists". 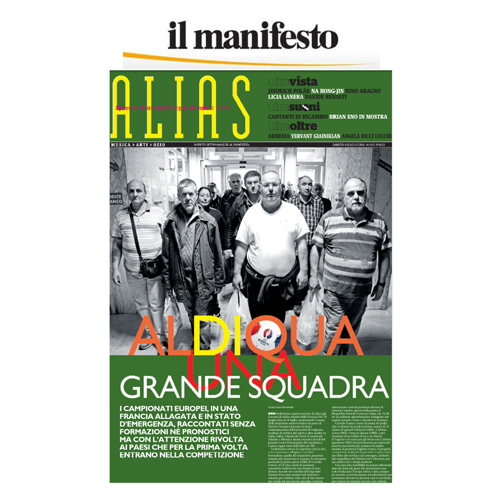 IL MANIFESTO - ALIAS, 04.06.2016, Silvana Silvestri: "With a rare sensibility he has had the opportunity to talk about one of the darkest issues that strikes not only Italy but Europe in its entirety." 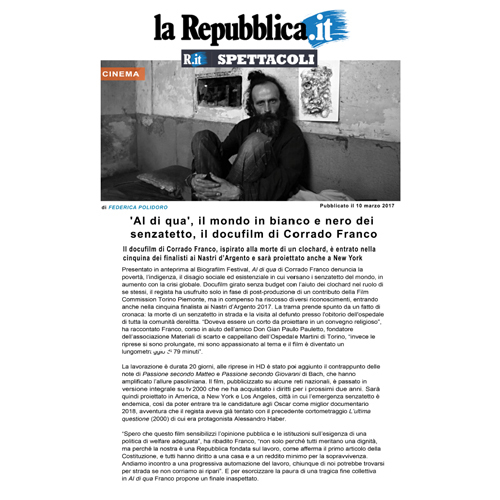 IL CORRIERE DELLA SERA, one of the major Italian newspapers 31.07.2017, Emanuele Breccia: "Al di qua" is therefore a poetic film of social denunciation, which mixes poetry and realism, shot with a visionary style on the universal drama of poverty. 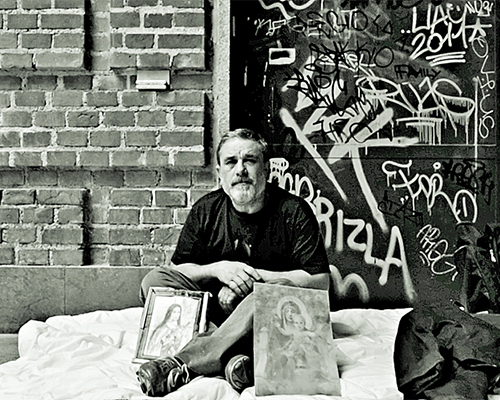 With homeless people who play the part of themselves, without filters and special effects. "Al di qua means to have a very difficult life," says one of them. "This is egoism," adds another. 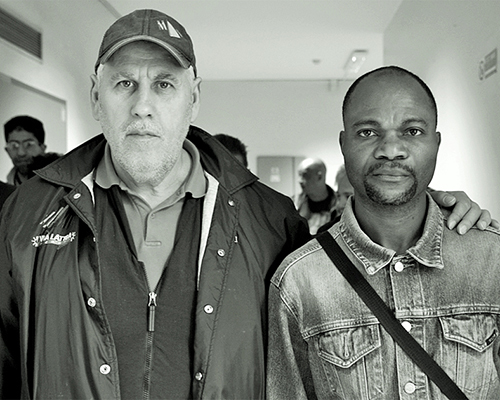 "In November 2013, I found myself without a house, without work, without anything," says a man over the age of sixty. "I ask that a home be given to everyone, because we all deserve it, a home for everyone." "Two years ago I had a firm that employed at least eighty people. My wish is to recreate it again to get back to work and those who I left at home” adds another. The docu-film, therefore, also aims to be this: a window on the drama of the thousands of people living in the streets, in the dormitories, in the ruined buildings. People looking for dignity, opportunity, the possibility to be able to embark on paths of autonomy and socialization. The strength of these images and of these tales can draw the attention of the institutions, at all levels, to make their own contribution. Not to be spared." LA STAMPA, 06.12.2016, Franco Giubilei: "The soundtrack includes a few pieces from Matthew’s Passion and John’s Passion by J.S. Bach and it is extremely powerful and dramatic." TELE SETTE, 08.11.2016, review TV with four "stars": "A protest documentary film about the difficulty of homelessness, too often stigmatized. The film tells the reactions of a homeless group to the death of their friend. Noble intentions, gorgeous form." IL FATTO QUOTIDIANO.IT, 02.11.2016, Fabio Balocco: "Shot in rigorous black and white film, the image of the poor is also rigorously devoid of rhetoric, accompanied by Bach's music, Al di qua is a sincere and touching movie that we should all see." 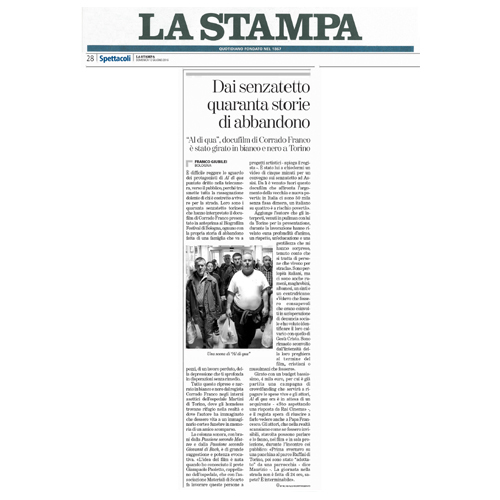 LA STAMPA, 07.10.2016, Tiziana Platzer: "An essential synthesis of the tragedy of a life on the street." LA REPUBBLICA, 12.10.2016, Clara Caroli: "A touching fresco about new poverty, the universe of the defeats that the economic crisis has condemned to social exclusion. 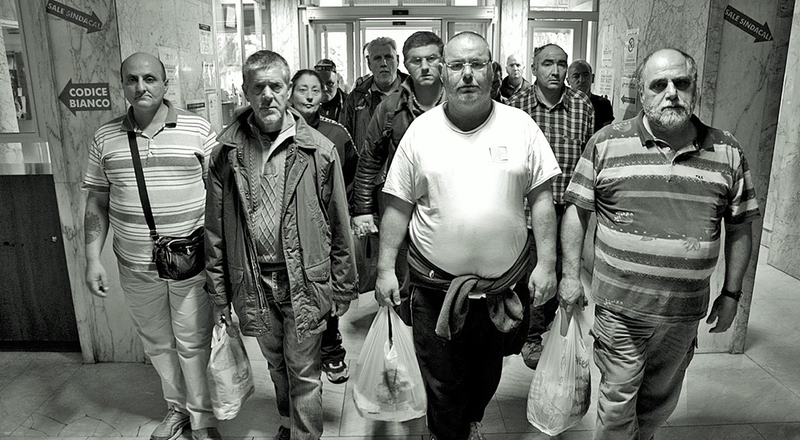 A journey among societies most marginalized, these forty homeless people that the director (already winner of a Globo d’oro /golden globe and a Nastro d’argento/silver ribbon) meets in the centre of Turin or in the most deserted suburbs, are street lives, stories of marginalization, sickness, discomfort, shame, sorrow. A gallery of derelicts share their humanity, without hypocrisy, but with compassion, and with the intense style of black and white." 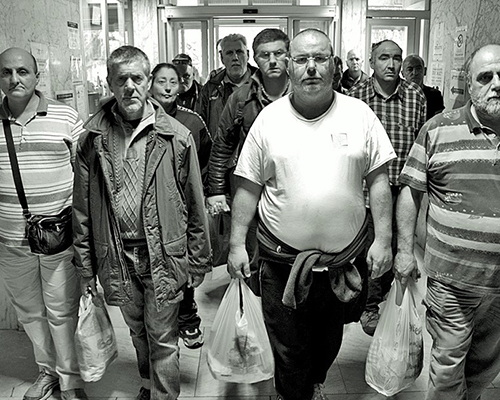 FAMIGLIA CRISTIANA, 13.11.2016, Eugenio Arcidiacono: "Filmed in black and white in Turin, the docu-movie gives voice and dignity to men and women who spend their days as ghosts between the elegant city porticos or the most desolate suburbs. Up until the poetic ending, when forty homeless, as in a Via Crucis, marked by the sublime notes of Passion According to Matthew and Passion According to John of Bach, they find themselves at the Martini Hospital to pay homage to one of them who has left." 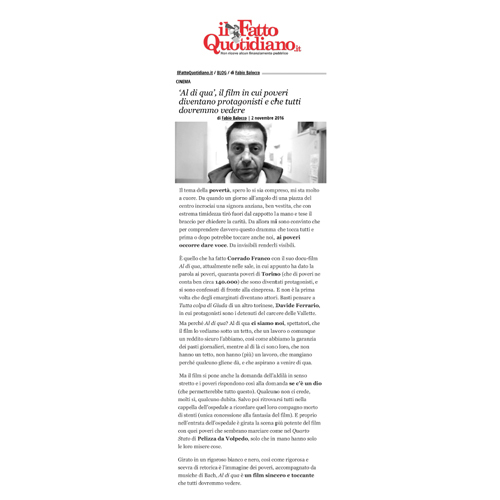 IL FATTO QUOTIDIANO, 06.10.2016, Annamaria Pasetti: "AL DI QUA by Corrado Franco, a filmic object that blends social documentary, prayer and poetry, that will not leave you indifferent." 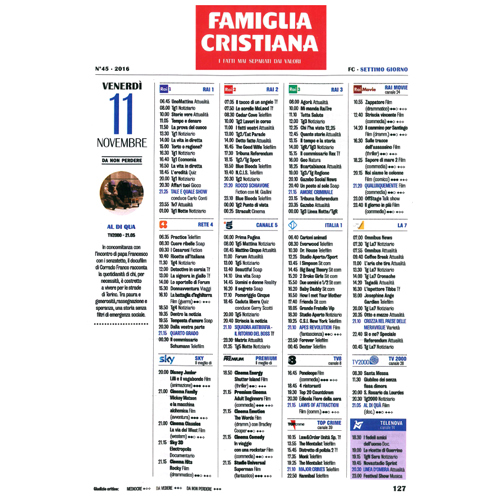 FAMIGLIA CRISTIANA, 06.11.2016, TV review: "DO NOT MISS. 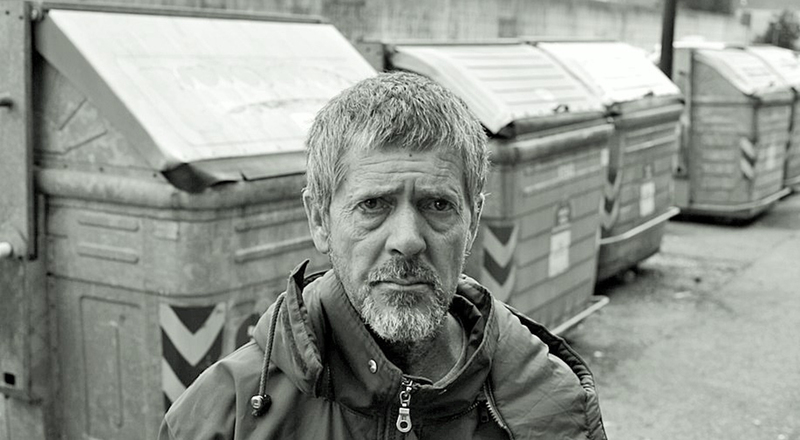 Concurrently with the meeting of Pope Francis with the homeless, Corrado Franco's docufilm tells the daily life of those who, by necessity, are forced to live in the streets of Turin. Between fear and generosity, resignation and hope, a history without social emergency filters." CIAO CINEMA.IT, 25.03.2017, Fabio Zanello: "Without history, without hygiene, no pedagogy, cinematic wonder, man crumb by crumb." This opening quote by Jean Epstein, from the text Bonjour cinéma, fully synthesizes the cosmogony of the invisible, which enters the docfilm of Corrado Franco, entered as one of the five nominees for the Nastri d’argento. "," Franco has a courage like few other Italian directors to embark on a journey into the metaphorical power of those who live on the margins of society, during a time when the evils of Belpaese are translated into images from our cinema, above all by the satire of comedy or documentary fashion. "," Franco sharpens the dramatic performance, excluding the goodness of generosity prepared at the table of the Caritas (Italian non-profit), choosing an almost Dreyerian cinema, to intimately tell the tragedy." 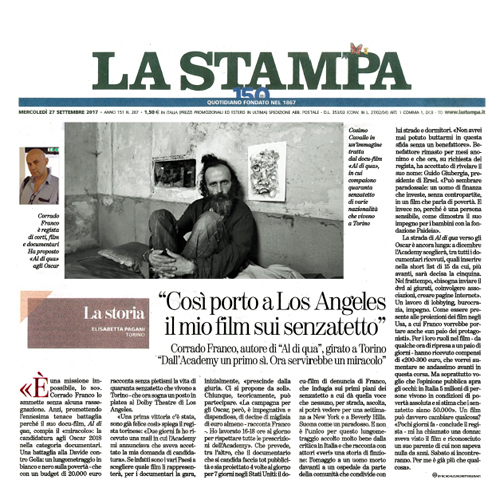 THE ITALIAN INSIDER, 13.08.2017, Zoe Tidman: "“AL DI QUA” is a docufilm by Corrado Franco which reveals the torment and humanity behind the homeless of Turin. 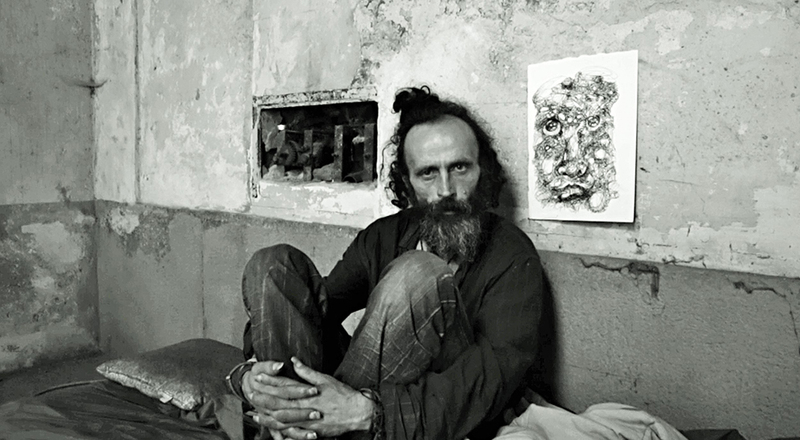 It aims to “increase the public’s awareness” of poverty and homelessness in Italy and to encourage the government to “work together to find a solution immediately”, "As well as being an exceptional work of art, its haunting message of the forgotten poor gives it both resonance and relevance to the world we live in today." Interview with Corrado Franco at TG RAI NEWS 24, 31.10.2016, Carlotta Macerollo. On the 18 May 2016 the director Corrado Franco and two homeless people in the film, went to “LA VITA IN DIRETTA” (Live Life) on RAI 1 TV. Interview to TG3 RAI TV News, 08.06.2016. From the news titles and from 10'08 to 14'30". Interview to CINEMATOGRAFO, RAI 1, Gigi Marzullo, 08.10.2016. Interview with Hollywood Party, popular radio programme about cinema on Radio 3 RAI, 08.06.2016. From 36’06” to 41’56”. "A SUA IMMAGINE" NEWS, RAI 1. Betting on 05.06.2016, from 26’40 to 27’09”. Interview with Corrado Franco, Radio 1 RAI, "RESTATE SCOMODI", 11.10.2016 - From the beginning. 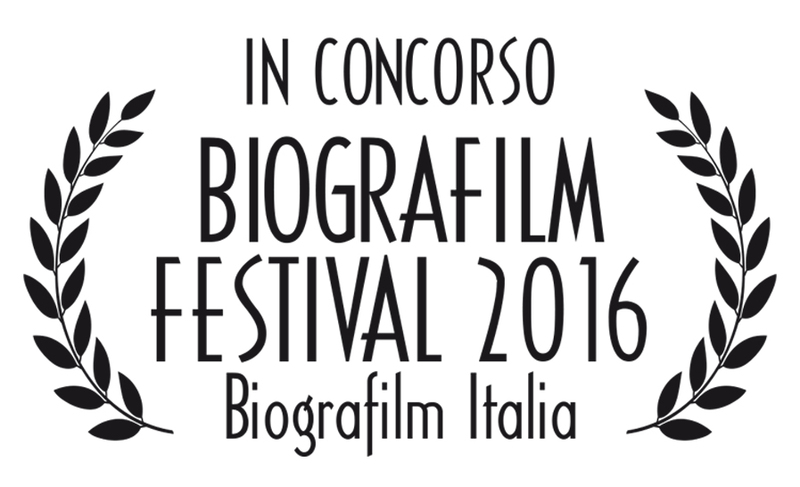 BOLOGNA BIOGRAFILM FESTIVAL. "AL DI QUA" premiered worldwide in Official Competition on June 10, 2016 at the Bologna BIOGRAFILM FESTIVAL, one of the most important documentary festivals in Italy. 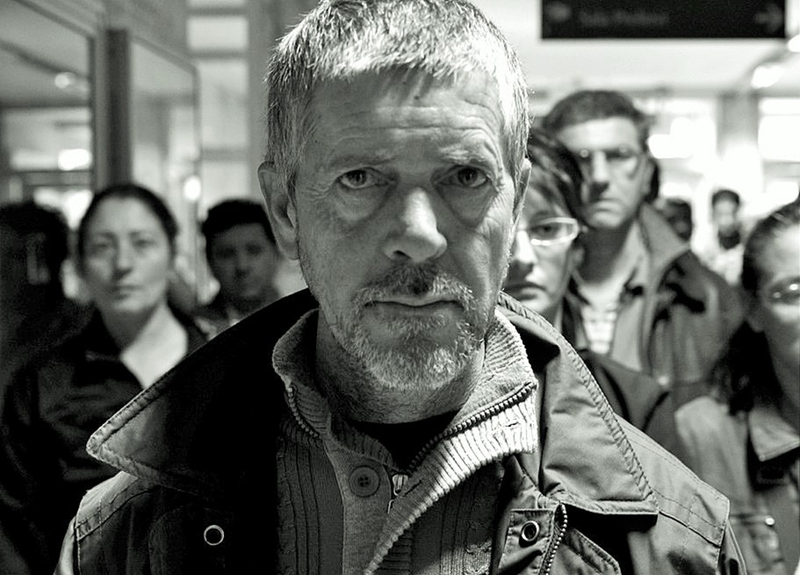 Forty homeless actors participated in the “AL DI QUA” film preview. They travelled from Turin to Bologna on a coach specifically hired for the event. TURIN. "AL DI QUA" was released in Turin on October 7, 2016, for a week at the CINEMA CENTRALE D’ESSAI. Attending the preview were the 40 homeless protagonists of the film, the director Corrado Franco, Archbishop of Turin, the Councillor for Welfare and the Councillor for Education in the City of Turin, and Don Gian Paolo Pauletto, chaplain of the Martini Hospital in Turin. ROME. 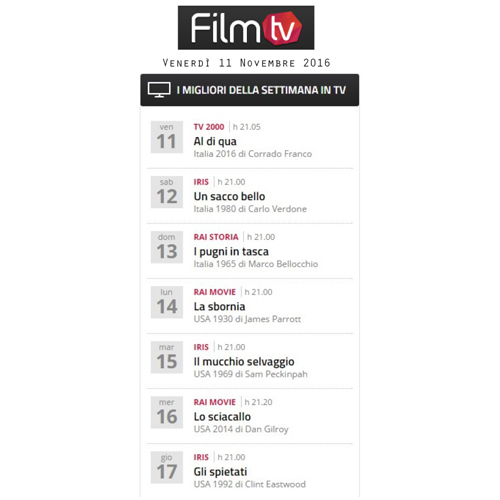 "AL DI QUA" was released in Rome on October 10, 2016, for 18 days at the CINEMA TIZIANO. Attending the preview were the director Corrado Franco, the Councillor for Welfare of the City of Rome, the spokesman for the community of Sant'Egidio, a worldwide movement present in 70 countries that assists the poor, and Don Gian Paolo Pauletto. ASSISI. "AL DI QUA" was screened in the ancient TOWN HALL OF ASSISI, the city of Saint Francis, on October 4, 2016, Feast Day of St. Francis of Assisi, attended by the Mayor of Assisi. TURIN. 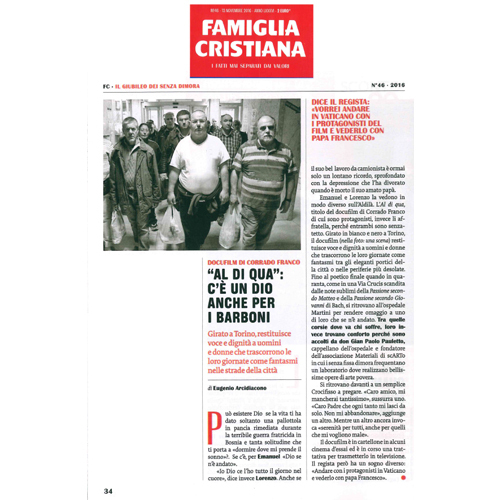 "AL DI QUA" was presented in Turin on October 10, 2017 at the Association Bartolomeo & C., an association assisting the homeless in Turin with 19,600 visits in 2016 alone. VERCELLI. 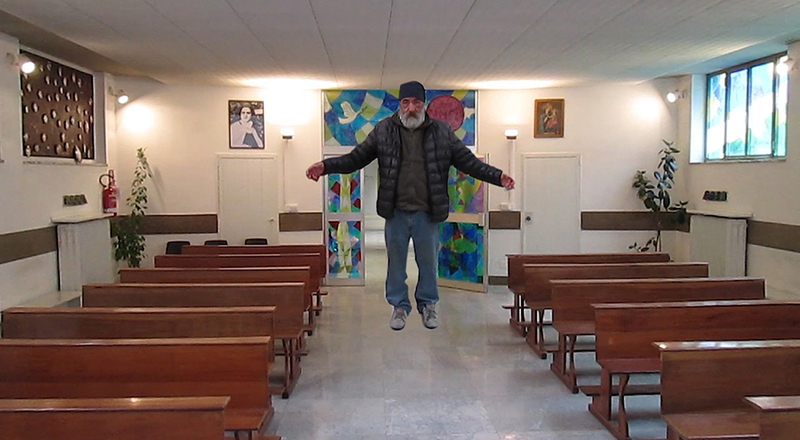 "AL DI QUA" was presented on January 12, 2017 in Vercelli, near Turin, in the ancient Basilica of Sant'Andrea, the bishop of Vercelli and numerous volunteer associations assisting the homeless were present. FILOSOFARTI. "AL DI QUA" was presented at FILOSOFARTI, a festival of Philosophy and Arts at the Teatro delle Arti Cinema di Gallarate, Milan, on February 23, 2017. PADOVA. "AL DI QUA" was presented at the Padova University of Medicine, department of social service on March 28, 2017. RAI. 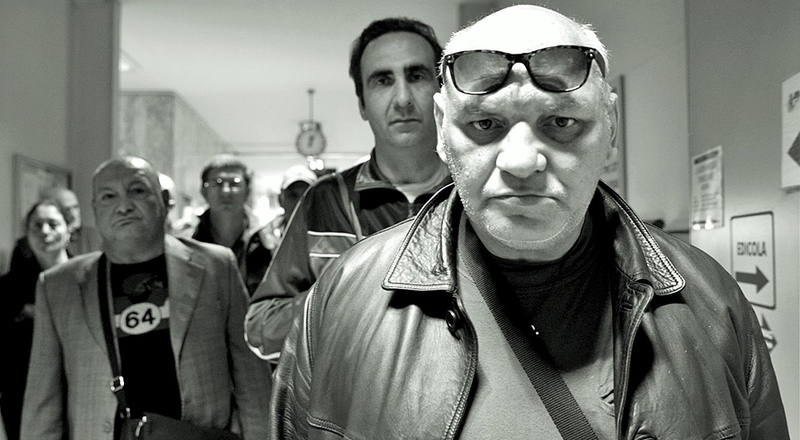 “AL DI QUA” TRAILERS. The "AL DI QUA" trailers were broadcasted in Italy on RAI networks for four weeks beginning on September 25, 2016, and were seen each week by about 6 million viewers. TV 2000. 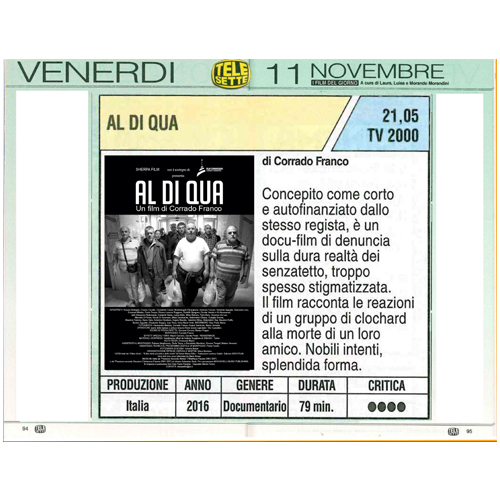 On November 11, 2016 "AL DI QUA" was aired on the Italian National channel TV 2000 during prime time, generating 400,000 contacts peaking at 120,000 viewers with an average of 80,000 viewers. "AL DI QUA" was also broadcast on TV 2000 on January 15, 2017 and July 3, 2017. 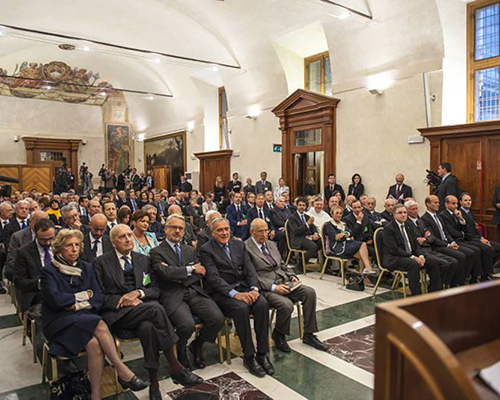 On July 12, 2017 "AL DI QUA" was presented to the Senate of the Italian Republic in Rome. 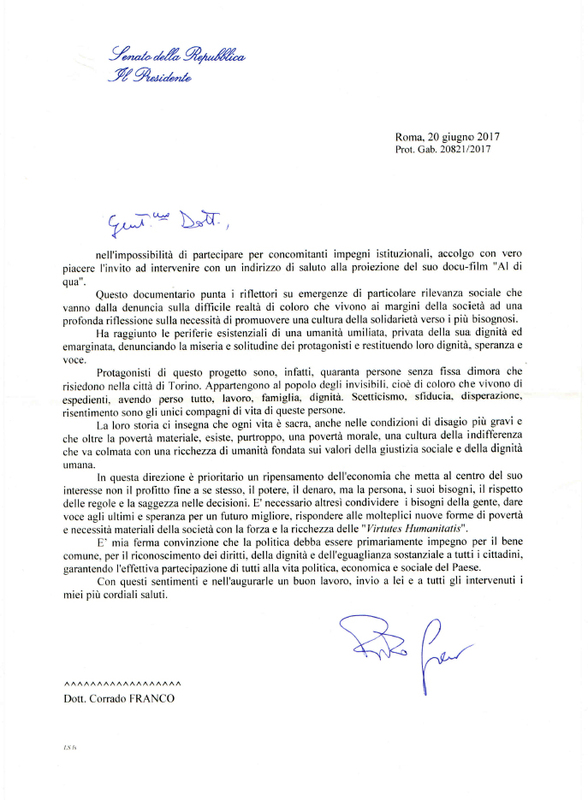 The President of the Italian Senate, Pietro Grasso, the second most important position in the Italian Republic, wrote a beautiful and touching letter on poverty and the documentary "AL DI QUA", which the homeless actor Giancarlo Levo read to the Senate. After the projection of “AL DI QUA”, there was a debate in the Senate on the theme: "Al di qua. Cinema of the real. Poverty in Italy in 2017". 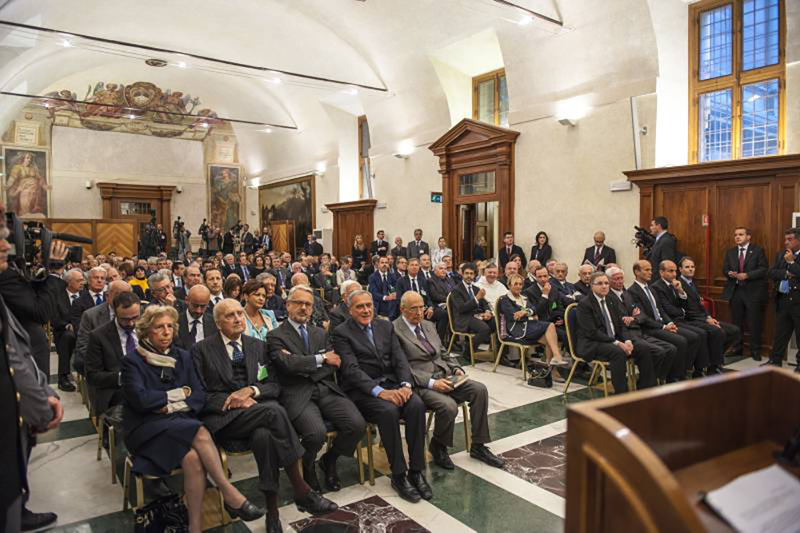 Speakers included Corrado Franco, Congressmen, Senators, Union Leaders, Economists, Don Gian Paolo Pauletto, and Giancarlo Levo, a homeless actor in “AL DI QUA”. While sorry not to be able to be present, due to previous institutional engagements, it is with great pleasure that I accept your invitation to address my greetings for the presentation of the docu-film “Al di qua”. This documentary highlights especially relevant situations: from the difficult condition of those living at the margins of our society to a profound thought of the necessity to promote a culture of solidarity towards the people in need. This documentary has reached the existential edge of a humiliated, marginalized, no-dignity humanity. It denounces the misery and the loneliness of its protagonists, giving them back dignity, hope and a say. 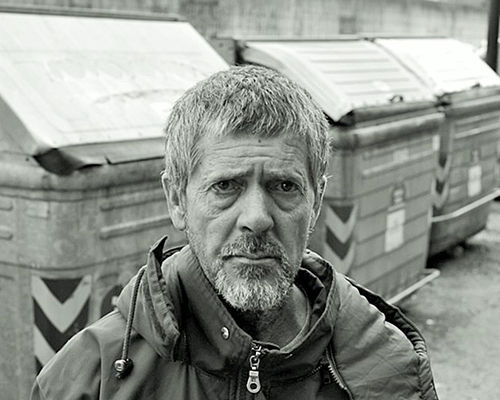 Protagonists are 40 homeless from Turin, who belong to the invisibles’ population, those who live of tricks, having lost jobs, family, dignity. Scepticism, desperation, lack of confidence and resentment, are these people’s only companions. Their history teaches us that every life is sacred, even in the most adverse conditions; that unfortunately beyond material poverty exists a moral poverty. This culture of indifference must be filled by the richness of a humanity based on social justice and human dignity. Thus it is important to rethink the economic theory so as to put the individual and his needs first, having rules and wisdom in mind, not power, money and profit. It is also necessary to share people’s needs, to give hope to those who are behind, hope for a better future, thus giving an answer to the new shapes of poverty and material needs with the strength and the richness of Virtutes Humanitatis. I strongly believe that politics must primarily be engagement for the common wealth, for the recognition of rights, dignity and equality of all citizen, guaranteeing the participation of everybody to the political, economic and social life of the Country. With these feelings, I send you and all the participants my very best wishes. Service on the TG3 RAI, from 14'40 "to 15'30", 12.07.2017. 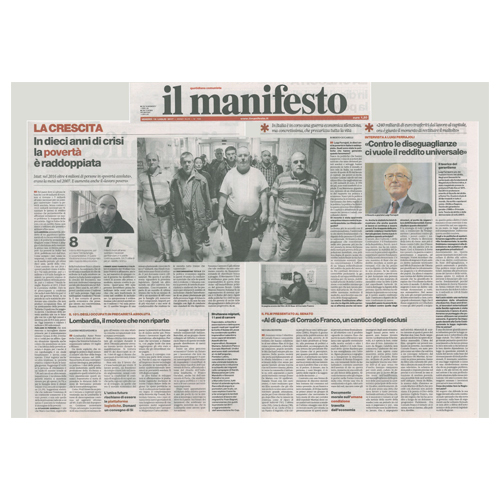 Article on MANIFESTO 14.07.2017, Silvana Silvestri (see the original article in the scan file, the link here is from another site that contains the article on MANIFESTO). Article, in English, ITALIAN INSIDER, Zoe Tidman, 13.07 2017. 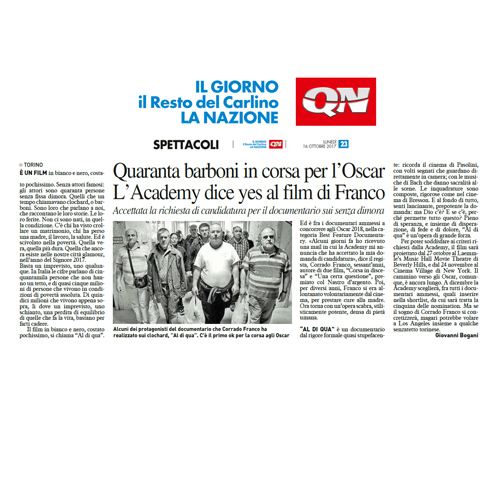 LA STAMPA.IT, news of the presentation of "AL DI QUA" in the Senate, with the trailer of 2'27", 11.07.2017. CNN conducted an interview with Corrado Franco that has not yet been published. Film shot almost in Full HD. Running time (25 fps): 79'. All the voices in “AL DI QUA” are a bit slower for artistic needs. 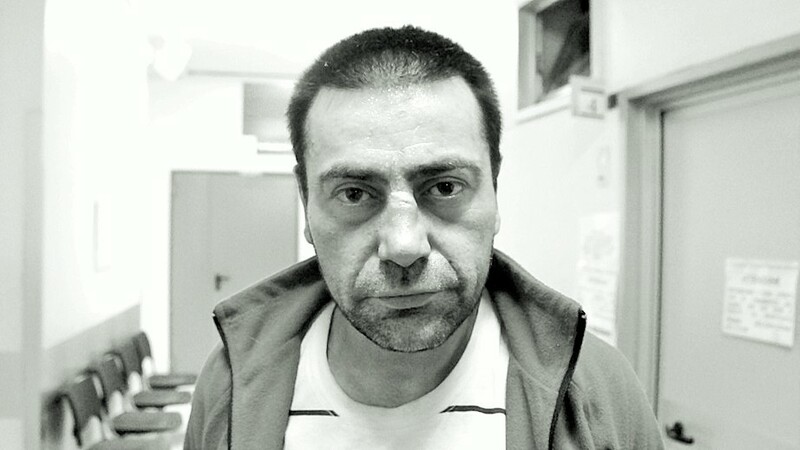 Corrado Franco’s works as a director include feature film “AL RIPARO DA SGUARDI INDISCRETI”, Special Jury Prize at Bruxelles Film Festival, the TV Movie for RAI “L’ULTIMA CORSA”, and the feature film “CORSA IN DISCESA” (“Debt of Honor”, adapted from a story by Cornell Woolrich), starring Rüdiger Vogler (main actor in many Wim Wenders’ films) and with the cinematography by Luca Bigazzi (“THE GREAT BEAUTY” - OSCAR® WINNER). “CORSA IN DISCESA” was produced by Corrado Franco’s Sherpa Film company in collaboration with MEDIASET GROUP, MEDUSA DISTRIBUTION. The film was presented at the TORINO FILM FESTIVAL (OFFICIAL COMPETITION) and won the QUALITY PRIZE BY THE MINISTRY OF CULTURE awarded to the 10 Best Italian Films released in Italy. 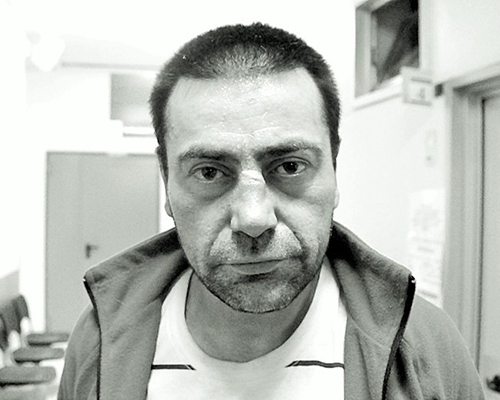 Corrado Franco directed the short film “L’ULTIMA QUESTIONE” (THE LAST QUESTION, 2000). “L’ULTIMA QUESTIONE” won several important awards including: GLOBO D’ORO (Golden globe) 2001 BEST ITALIAN SHORT FILM awarded by the Foreign Press Association in Italy and NASTRO D’ARGENTO (Silver ribbon) 2001 BEST ITALIAN SHORT FILM awarded by the SNGCI, the Italian Film Journalists Union. The short movie has also been selected in the Official Competition at: Montréal, Clermont-Ferrand, Los Angeles, Manchester, PiFan Puchon, Palm Springs, Saint Petersburg Film Festival, and in many other Festivals. The short film “L’ultima questione” (“The Last Question”) achieved the "eligibility" for the ACADEMY AWARDS 2002, Best Live Action Short Film. As of 2003, Corrado Franco looked after his ill mother Gigliola Carusi Franco, a literary teacher, playwriter, theatre director and poetess, who was severely ill with Parkinson and passed away in February 2013. 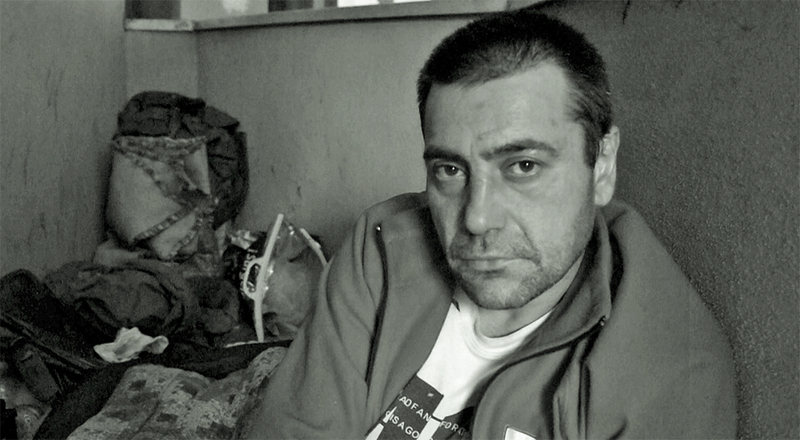 In June 2016 Corrado Franco completed “AL DI QUA” (Life Here), a poetic social protest docu-film, shot with a visionary and rigorous style, on the humanitarian tragedy of universal poverty and homelessness. 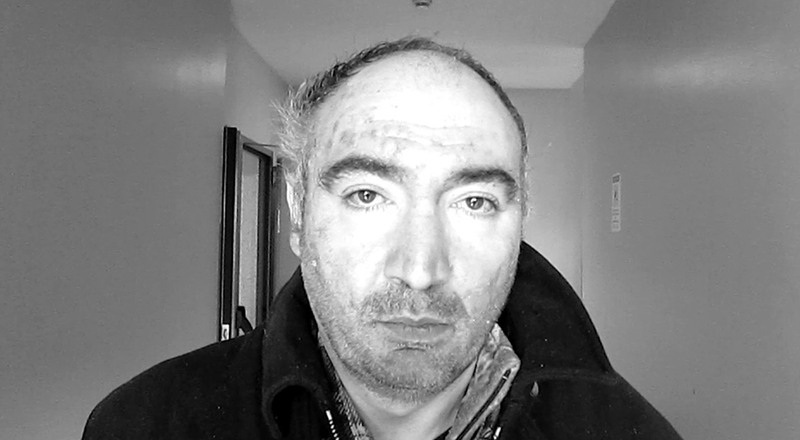 Corrado Franco has been Professor of Film-making studies at the University of Turin. In Italy approximately 5 million people live in total poverty and over 8 million in conditions of relative poverty. One italian out of four risks poverty. The estimated number of homeless people is approximately 50.000. In Europe approximately 122 million people are on the poverty line and risk social exclusion. Approximately 800 million people in the world suffer hunger. "Kommt, Ihr Töchter, O Lamm Gottes"
"Er nahm alles wohl in acht"
Special thanks to Don Gian Paolo Pauletto, Chaplain of the Martini Hospital in Turin, the founder of the “Materiali di scarto” (“Scrap Materials”) Association. This film would not have been possible without him. MARCO GREMO - BARTOLOMEO & C.
MMXVI - © SHERPA FILM S.R.L. ALL RIGHTS RESERVED SHERPA FILM S.R.L. © 2016. Sherpa Film S.r.l. All Rights Reserved. I dati personali raccolti mediante il form contatti saranno inviati via email al gestore del presente sito web, Corrado Franco, che sarà titolare del trattamento. We inform you that the data will be provided to the present site when filling in the "contact form" (said also form mail) of the site itself, will be treated in accordance with the provisions of Legislative Decree 196/2003, Code on Protection of your personal data. The contact form made available on the site has the only purpose to allow visitors to the site to contact, if wish it, the site manager, by sending through the above form an email to the manager. This information relates to your personal information submitted by the visitor user when completing the form contacts. We inform you that the data provided voluntarily through the form will be transformed into an email that it may possibly be stored inside the system receiving emails used by the site owner. These data will not be recorded on other media or devices, nor will any other data derive from the navigation on the site. The data you send will be used only in order to be able to contact you through your references left through the contact form to evade any of your requests contained in the message you sent via the contact form put to available on the site. a. The personal data processed will be exclusively the common data strictly necessary and pertinent to the purposes set out in step 1 above. b. The processing of personal data is realized by means of operations or of the complex of operations indicated in art. Paragraph 4, paragraph 1 a) D. Lgs. 196/2003. c. The treatment is done directly by the owner organization. There is no obligation to give the manager of this site the personal information required in the contact form. Providing data via contact forms is optional. However, refusal to confer for the purposes of which to the art. 1 will result in the impossibility of contacting the manager of the website via the contact form provided on the site. Personal data collected through the contact form will be emailed to the manager of this website, Corrado Franco, which will be holder of the treatment. Subjects to whom personal data refer to have the right at any time to obtain confirmation of the existence or not of the data themselves, and to know its content and source, to verify its accuracy or request updating, integration or correction (Art.7 D. Kgs. 196/03). Under the same article, you have the right to request the deletion, , transforming into anonymous form or blocking data processed in violation of law and, in any case, opposing their treatment for legitimate reasons. Treatment will not last longer than necessary for the purposes for which the data was collected.